In a sellers’ housing market, many VA buyers turn to foreclosures to try and make the most of their homebuying budget. It’s often true that foreclosures and other bank- or agency-owned properties are priced lower than standard listings. But closing on distressed properties can be tough. The process can take months, and banks tend to sell these homes “as-is,” meaning they’re not willing to make or allow repairs needed to satisfy the VA appraisal process. For VA buyers, purchasing a foreclosure property can be challenging, but not impossible. Follow these tips, and you could walk away with a great home at a good price. Tip 1: Look for homes in good shape. Foreclosed properties have a reputation for being in less-than-pristine condition, but the VA sets property standards for health, safety and structural integrity that generally need to be met before you can close on a home. You may run into trouble if you have to ask the seller to complete or allow repairs. The best solution for a VA buyer is to simply avoid homes that are in poor condition. As a rule of thumb, the VA home loan is meant for turnkey properties. 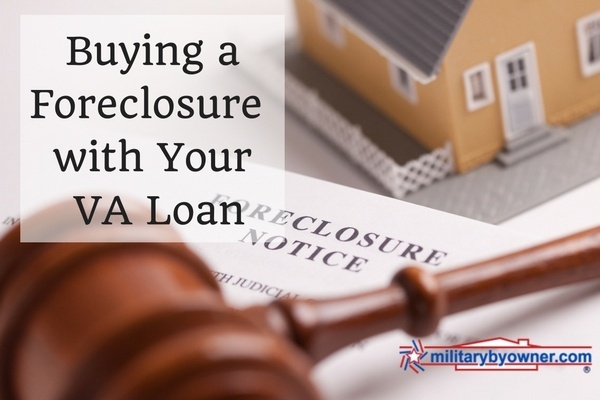 Educate yourself about VA requirements before you start shopping foreclosures, and avoid properties suffering from deferred maintenance and vindictive damage. Lenders and real estate agents who truly understand the VA loan process can be a tremendous asset when you’re starting the home search. More importantly, getting prequalified and preapproved for a VA loan before you start house hunting is critical. VA loan preapproval gives buyers a clear sense of their purchasing power and prepares them to spring into action. Tip 2: Understand repairs aren’t always possible. That doesn’t bode well for VA buyers, who will typically need the home to meet the VA’s health, safety, and structural requirements before closing. If repairs need to be made in order for a loan to close, and the seller won’t allow them to be made, you’ll have to look elsewhere. Most VA purchase loans close in 30 to 45 days, but it may take longer — sometimes a lot longer — to finalize a foreclosure purchase. The sale approval process for bank-owned homes can be especially time consuming. Factor that into your purchasing timeline, and make sure you have provisions for housing and storage in case you face closing delays. Working with a lender and real estate agent that really know VA loans can also make a big difference. A knowledgeable team will help you steer clear of problematic properties. For more information about using your VA Home Loan, click below.